When DC-based hospitality journalist Rahim Kanani sat down at Minibar in 2012, he didn’t expect the experience to redraft his relationship with the culinary world. The freelancer, whose interview subjects span from Alicia Keys to Tony Blair, was totally entranced by José Andrés’s avant-garde tasting menu. “The whole theater of the experience was very exciting and mysterious at the same time,” he says. The meal motivated him to look more closely at high-end cuisine and the chefs behind it. The sum of that examination is A Wealth of Insight: The World’s Best Chefs on Creativity, Leadership, and Perfection. 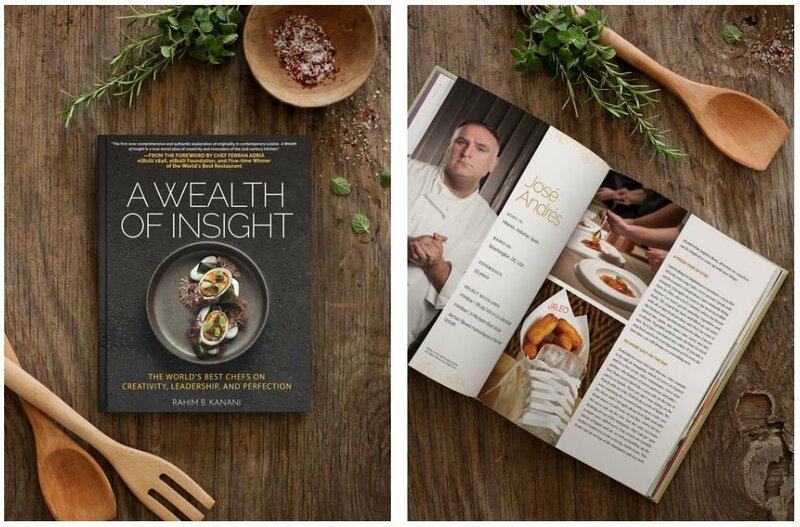 The book is a compilation of interviews with 44 of the world’s most renowned chefs, including some of DC’s own culinary superheroes: Andrés, Pineapple and Pearls’ Aaron Silverman, and Inn at Little Washington’s Patrick O’Connell. Washingtonian spoke with Kanani about the things that struck him most about these culinary legends. Why did you undertake the monumental task of creating this book? It wasn’t until I saw the Netflix Chef’s Table series in April 2015, when I thought, ‘This is a really interesting way to get the larger story of a chef’s life.’ I went to the bookstore thinking there would be a book on this, to see what world class chefs have in common, and it didn’t exist. What’s distinctive about DC’s food scene? When I first moved to DC, I thought there weren’t that many options in general. Now, I feel like there’s another restaurant opening up every other day or other week. I think that’s what’s made this such an interesting place. It’s all happened so fast. When you think about some of the great food cities around the world—now that I’ve been to some of these places and spoken to some of the chefs—there are references to DC chefs on a regular basis now. It’s a place to start a new restaurant, a place to experience a wide range of cuisines within the food industry because of the kind of larger global nature of the city itself. There’s a natural diversity there that’s been tapped into. That’s why so many cuisines are flourishing here. What are some common traits among the chefs you interviewed? What surprised me over these interviews was that, just as a musician can form a piece of music in their mind long before they even write it down, these chefs can taste various ingredients mixed together, mentally, before they go into the kitchen. Their memory bank is full of hundreds, if not thousands, of ingredients. They’re able to mix and match, intellectually tasting combinations that have yet to exist. It’s the memory of flavors that is one of the most unique features of their minds. What’s the biggest but least talked-about challenge to being a great chef in 2019? If you turn on the TV and watch Top Chef or watch the Food Network, they glamorize the profession in a way that isn’t necessarily helpful. Folks in the book mention how the road to success in this industry is not traveled overnight. It’s not even guaranteed. It’s just a lot of hard work—14 or 16-hour days, everyday. They don’t take days off, even. The first interview in the book is with Anthony Bourdain. He sums it up quite well: if you’re going into this profession to become rich, a celebrity, it’s not going to work. The chefs were trying to make the case that the industry is hard. It’s not for everyone. You have to love it to death for it to work. It’s about passion, grit, perseverance, a willingness to fail. The whole nature of the process is about failing and using failure to actually do something different and learn something new. What two interviews were the most disparate from each other? There was one chef, Chan Yan Tak of Lung King Heen in Hong Kong, who said that he doesn’t eat at high-end restaurants like his because he doesn’t want to be influenced by their creations, even subconsciously. You have this notion of someone who wants to remain as original and pure as possible to his style and creative process. On the other hand you have chefs like Emma Bengtsson at Aquavit in New York City, who say there’s no better way to being inspired than going out to eat. What was the most unexpected source of inspiration for subjects? What surprised me was how varied the inspiration was and what setting they’d get inspired in. You had some chefs getting inspired by a feeling, an aroma, a photograph, walking through the woods. It’s anything and everything as long as there’s a willingness to be inspired in the first place. It was more of the attitude that allowed for the inspiration to happen. For some of these folks their most interesting ideas come while they’re in the shower. One thing that stood up amongst these different chefs is that they all walk around with a notebook. They recognize how fleeting inspiration actually can be. So they always write down immediately what’s in their head—what they’re seeing and feeling, because these are all things that they can reference later. Of everyone you interviewed, who was the most different than you expected them to be? I would say Patrick O’Connell of the Inn at Little Washington. He’s incredibly smart, incredibly philosophical about his work and his craft. You got the sense that he sees the world through food in a way that I think is unique to himself. When you have someone saying that they see their work as a “healing artform,” you’re wondering where this all came from. When you think about his own story, finding himself in the kitchen amongst “lost boys”—that’s the phrase he used—he found the camaraderie and weirdness amongst the staff and the chefs. He just fit in the way he wanted to fit in. One thing he said to me was quite revealing: You never arrive in this business, you’re always only 60 percent there. It’s this lifelong, reinterpretation of food, the environment, the experience, that is a never ending journey.